Less than eight months from now, Atlanta will host one of the biggest sporting events in the world – Super Bowl LIII. This will be the third time in the last 25 years Atlanta has had the opportunity to host the big game. On Wednesday May 16, Jackson Spalding’s sports marketing team hosted a panel discussion that attracted more than 200 attendees to The Gathering Spot in downtown Atlanta. Guests heard first-hand about the preparations the city is taking to welcome football fans, the NFL and a global audience to Mercedes-Benz Stadium on February 3, 2019. 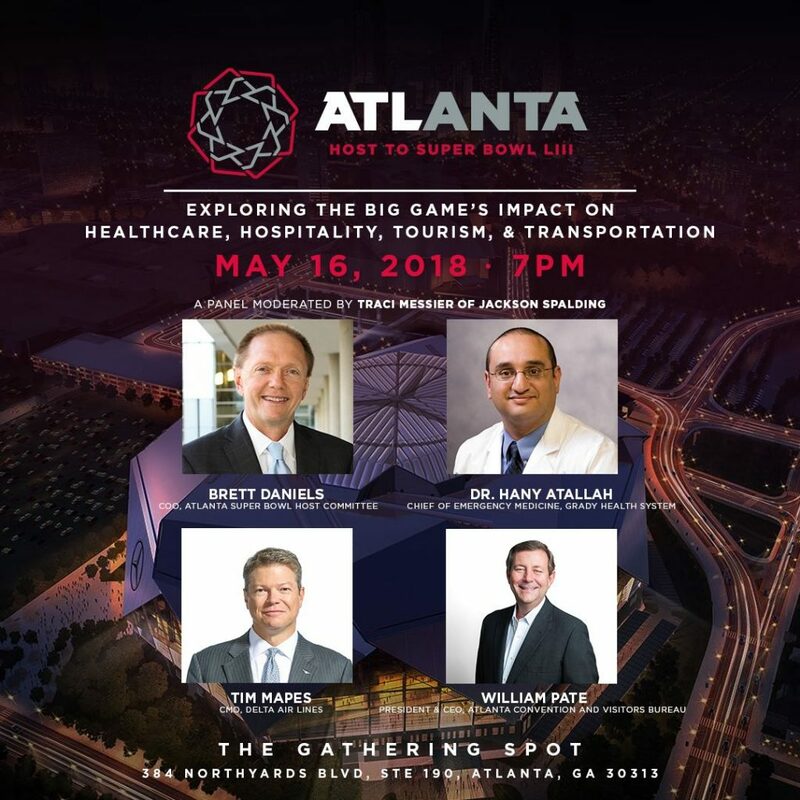 Conceived by our team, the event was dubbed “Exploring The Big Game’s Impact On Healthcare, Hospitality, Tourism, and Transportation.” Our dynamic panel included Atlanta Super Bowl Host Committee COO Brett Daniels — Chief of Emergency Medicine at Grady Health System, Dr. Hany Atallah — Delta Air Lines CMO Tim Mapes and Atlanta Convention and Visitors Bureau President and CEO William Pate. The discussion was flawlessly moderated and facilitated by JSer Traci Messier and hosted at our event partner The Gathering Spot, known for its curated and timely events, as well as diverse community. Dr. Hany Atallah shared the significance of Grady Hospital’s impact on a successful Super Bowl experience, but any major sporting event. Tim Mapes discussed the various ways Delta Air Lines is involved in helping Atlanta prepare for the influx of travelers and fans from all over the globe. William Pate championed the significance of the City of Atlanta, as we’ve successfully hosted several great sporting events in Atlanta over the years. “We want to show the city off. We want it to be the best Super Bowl ever. Our media relations team secured robust local coverage of the event, which got these messages out and into the community. See recaps below. Follow us on social for upcoming news about the Super Bowl, sports marketing and other JS events.